I’ve said this before and I’ll say it again: Dolce & Gabbana prints are the absolute BEST. While I don’t have a trip back to the Amalfi coast planned for anytime soon (hopefully next year once I’m done with big house purchases! ), this printed cotton skirt definitely makes me feel as if I’m there. 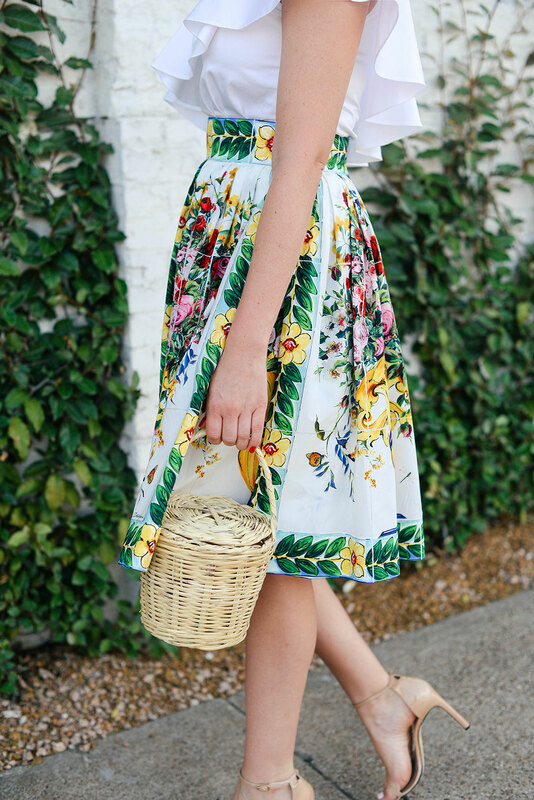 The brilliant print was inspired by hand-painted Italian pottery, and features overflowing blooms against colors one would find in Capri, Positano and those other dreamy Italian beachside towns. 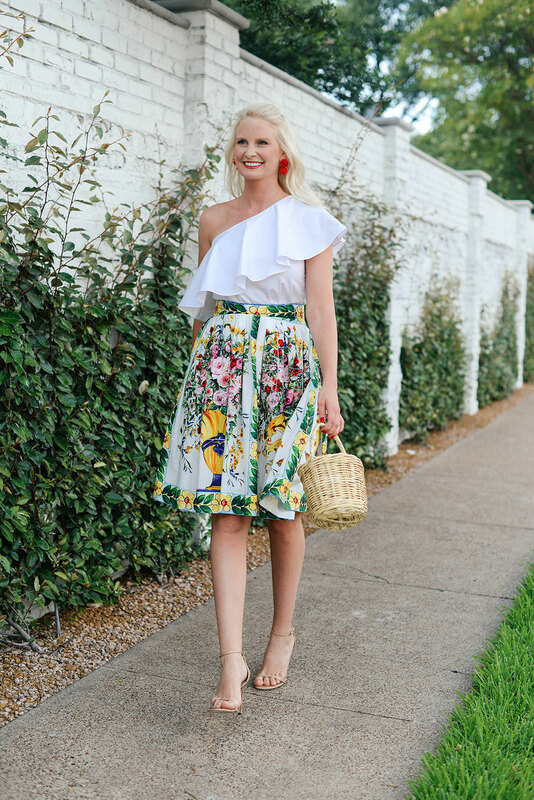 Whether you pair this skirt with a tee and flat sandals for daytime, or dress it up like I did here, it’ll instantly transport you to the land of Limoncello. I’m obsessed! This hydrangea print is my other favorite from their summer collection. Absolutely stunning! I also love this fit-and-flare number. The print I’m wearing also comes in these adorable shorts (gimme!!)! The handkerchief silhouette on this dress is unique and would move so gracefully as you walk – such a pretty style! 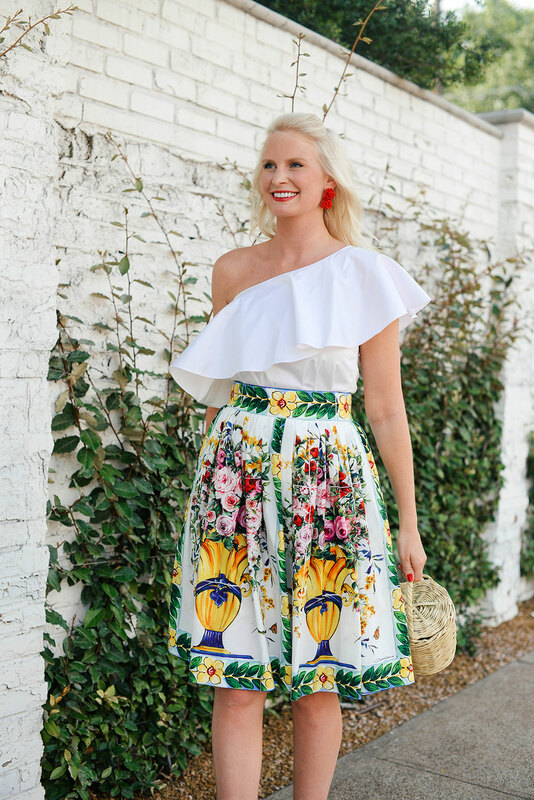 If you love this skirt style I’m wearing but want more print options, check out this pink look and this ravishing rose print. I adore the button detail down the front of this dress. It would be the perfect daytime option for travel, brunch and anything else! PS – I just had the most incredible weekend celebrating my birthday with all my favorite gals! Sadly they all flew home yesterday and this morning, but my family is flying out to join me on Wednesday. Tomorrow is my actual birthday, and I’ll be spending it grabbing lunch with my friend Mara in Newport Beach and then dinner with my friend Kat who lives in La Jolla! I may even throw in a spa treatment somewhere in there. Today, however, you can find me lounging by the pool! That skirt is stunning! Love the prints and patterns! Such a gorgeous skirt! Love how you styled and so glad you’re celebrating your birthday with friends and family! Your look is amazing. This skirt is wonderful. 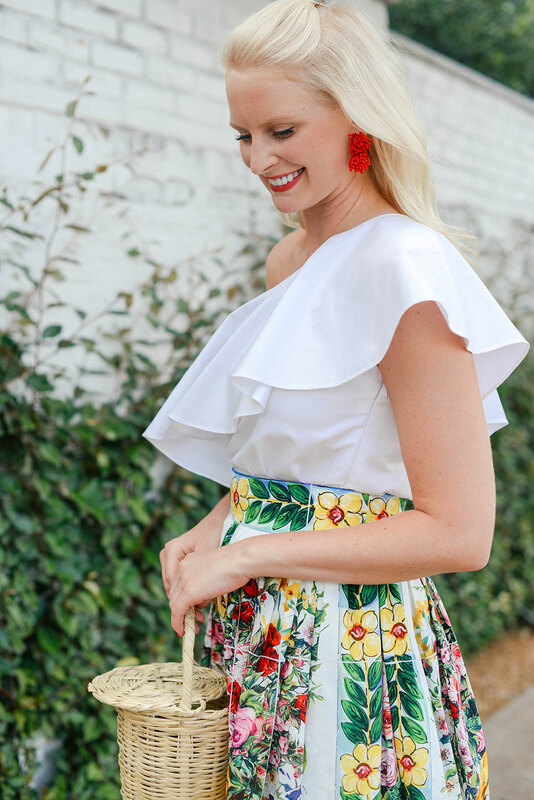 Such a beautiful and cute summer outfit! And btw. your skirt is gorgeous! Gorgeous skirt and stunning earrings!! This is STUNNING girl! I can’t believe how gorgeous that white top is either! So perfectly crisp and refreshing!